Today, we’re happy to announce the publication of our first LinkedIn ebook, a best practices guide for building a profile that tells who you are, what you do, and why you’re successful. 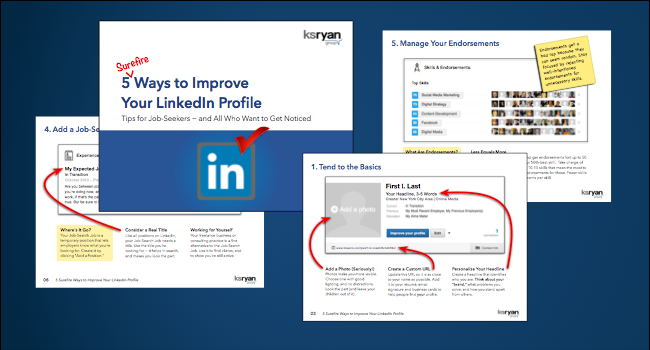 The ebook — 5 Surefire Ways to Improve Your LinkedIn Profile — explains offers advice on building a compelling summary, creating job descriptions that capture attention, and how to manage LinkedIn endorsements. It is based on work with hundreds of professionals, and is good for people “in transition,” those who might be in transition, and all who want to get ahead. Best of all, it’s free. Download it today.